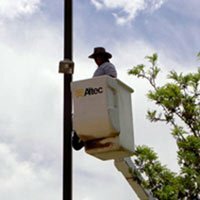 Congratulations to Keep Las Cruces Beautiful of Las Cruces, NM! The City of Las Cruces has been focused on addressing the growing graffiti problem in their city and implemented a comprehensive graffiti reduction program. This program included prompt reporting, quick abatement, community prevention and educational programs. Unfortunately, they were still seeing a rise in graffiti vandalism even with this well developed program. With this issue on hand, Keep Las Cruces Beautiful (KLCB) applied for the FlashCAM Grant to add a “new tool for the enforcement of existing graffiti codes and energize the graffiti enforcement community.” KLCB works closely with the Las Cruces Police Department (LCPD) Codes Enforcement division, and together they serve as the dedicated leaders overseeing this program to protect the community from graffiti vandals. In addition to deterring the taggers with their new FlashCAM, they plan to use the high resolution images that are captured on the FlashCAM to help them prosecute these graffiti vandals. This increase in arrest and prosecutions will also serve as a deterrent by sending the message that graffiti in Las Cruces will not be tolerated. For more information on Graffiti Hurts or the 2013 Grant Program, please visit their website at www.graffitihurts.org.